Cutting or Pulling: Time spent digging, cutting or pulling often results in encouraging the spread of Ragwort. Tiny pieces of root left behind can lead to the growth of bigger and stronger plants. Flowering Ragwort: Barrier H can be applied to flowering Ragwort but re-growth may occur especially in moist conditions. Apply Barrier H directly to the whole of the plant to help prevent the seeding process. 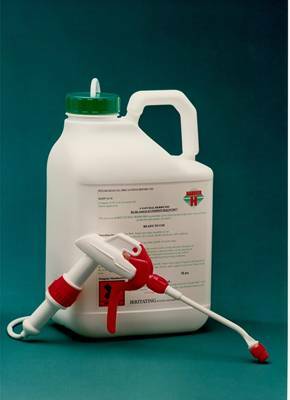 Spot Treatment: Barrier H comes in a 5L container with spray attachment and is used as a spot treatment for Ragwort. It is easy to apply holding the container handle in one hand and the spray gun in the other. One single squirt is sufficient to cover a tiny seedling. Seeds: Ragwort Seeds can lay dormant in the soil for up to 20 years. Each plant can produce up to 150,000 seeds with a 70% germination rate. Summer application: Late June, July and August are normally when Ragwort flowers. For every flowering Ragwort, there are around 10 small seedlings or rosettes close by which need to be treated before they too become large flowering plants. Flowering plants are more difficult to kill and so it is essential that Barrier H is applied to the whole of the Ragwort but not to the point of run-off. Winter Ragwort: Autumn, Winter and Spring are when rosettes are most visible. Grasses die back and most other weeds die off leaving the bright green Ragwort easy to see and to treat. However, to achieve the very best results, Barrier H is best applied in dry conditions. Availability: Available in 5L container with applicator from major Saddlers, Agricultural Merchants and Crop Care Companies. To find your nearest stockist, click on the 'Stockist' button on the front page and follow the instructions. A double pack containing 2 x 5L and 1 applicator gun is available over this website to customers living on the UK mainland only, South of Edinburgh & Glasgow. Order three or more containers to get carriage free. Customers living north of Edinburgh and Glasgow or on the Isle of Wight can call our helpful sales team on 01953 456363 for delivery charges or alternative suppliers. Endorsements: Barrier H was awarded a Major Commendation under the Business Commitment for the Enviroment Awards 2002 'Languard have been using Barrier H as part of our ragwort control programmes for several years. It is a highly effective tool in the campaign against ragwort, and we shall continue using and recommending it' LanGuard Ltd., Specialist Weed Management for Highways and County Councils (2008) 'By far and away the best Ragwort treatment I have come accross. Safe to both operator and environment and totally effective' Johnny Peter-Hoblyn, Stud Manager, Shadwell Estate Company (2002). 'The results are just as good as you predicted and the Ragwort seems to be killed almost overnight' Michael Elwick, Centre Manager, ILPH (2000) I would just like to say that your Barrier H has been an excellent product in controlling the ragwort within the ranges. It works extremely quickly and the applicators are easy to use. There is no doubt that we will be using Barrier H in the future on this 7,500 acre MOD estate. - Major M H Burgess, ARMY Range Control, Lulworth Camp, Wareham, Dorset. I used Barrier H during the trial period at Roudham Stud. In both damp and dry weather there was the same effect instant kill within several hours. This year there is no sign of regrowth. Tim Phillips, Roudham Stud, Roudham, Norfolk. An amazing cure, to a very big ragwort problem. I have 87 acres across the Salisbury plains, up and down dale. For 9 years we have tired to get rid of this plant, but every year it comes back with force. For the first year using Barrier H, the plains have not been a blaze of yellow, from the dreaded Ragwort. As we keep a large number of horses grazing on the plains, it has always been very worrying for us and it is nice to know there is little of the plant left, and very reassuring to know, if it does come back, we will be ready with the Barrier H Spray - Lesley Miles, White Horse Equestrian Centre, Westbury, Wilts. I felt I must write and congratulate you on the Barrier H ragwort spray; you have saved me from insanity! The first summer following the purchase of my property I found to my horror my 3 acres looking like a carpet of yellow. The first year I removed 50 bags, the second 40, I broke 5 trowels and it nearly broke me. Then I saw an article about Barrier H. I used over two containers and was so amazed that I rang my friends and my mother! I even went and sprayed a sample area at a friends. THANKYOU its well worth the money, if your company had shares I would invest all my money in it, what an excellent product, congrats to you. Miss D Masters-Brown, Alpington, Norfolk. I am not in the habit of writing to companies, mainly due to lack of time. Suddenly, I find, I have time to ride everyday, paint gates, fences and do all sorts of things. I have been digging our ragwort on some land that has been set-aside for several years. I finally had to concede that the ragwort was getting the better of me and in desperation purchased Barrier H. Within hours of spraying, the ragwort has disappeared, leaving only small brown circles to mark its passing. It is almost like a miracle, I can hardly believe it! I shall sing the praises of this amazing product at all the horsey related gatherings that I attend. Mary Potter, BHS District Rep. For Romney Marsh, Kent. I am writing to you after using Barrier H, to let you know how impressed I was at the result. My wife and I walked the land numerous times before buying and saw no signs of ragwort. When spring came, the lower part of my field was covered, and we were horrified to think that we had put the horses in this kind of danger. We pulled as much as we could using a ragfork but even this was back-breaking and the roots didn't always come out, leaving the chance that the plants would come back. I surfed the net and stumbled across Barrier H and although rather sceptical we decided to give it a try. The weather was hot, it was ideal, and I managed to spot spray about a quarter of it. To my surprise by the time I had finished one container, I could see the first plants sprayed were dying. After 6 hours all the plants on that patch had collapsed and turned brown and within 3-4 days the plants had died back into the ground. It has now been 10 months and the patch treated with Barrier H shows no signs of re-growth. The beauty of Barrier H is that you do not have to spend a backbreaking weekend pulling ragwort when you could spray in a fraction of the time, and then you can spend time enjoying your horse knowing that Barrier H is fighting the battle for you. - Stephen Smith. Melksham, Wilts. I feel compelled to write and congratulate you on your ragwort spray. I have to admit that when I first read about your product I was very sceptical. I was at a loss to understand how a plant-derived spray could be effective and work to my benefit. The alternatives remained traditional toxic sprays, which are dangerous to horses and they don't seem to stop the plants returning on mass every year! Thus I cautiously ordered your Barrier H. It worked! I have found the advantages of using Barrier H numerous and the ragwort was killed very quickly, plants turned black and 24 hours withered and brown - Amazing to see! I was very impressed and would have no hesitation in recommending it as a very effective way to help in the fight against this horse killer!! - Miss S Shaw-Browne, Sherwood Forest Livery Stables, Mansfield, Notts. What an excellent product Barrier H is. We used it for the first time on our paddock and within a day the rosettes had wilted and two weeks later there was no sign of the plants at all. This is going to make our paddock maintenance so much easier as we can deal with the rosettes as they appear. Well done the team at Barrier for another excellent product. Jenny Haywood, Petersfield, Hampshire. I have worked tirelessly to eradicate this awful ragwort, that we inherited. I have, through blood, sweat and tears reduced it but every year it tries again to give us the run around. In despair we bought Barrier H with the knowledge that all of your products have been excellent for horse care could be as good for pasture care? Well, I think so, it really seems to be working and so far I'm extremely impressed.' Carolyn Cummings, Penrith, Cumbria. Signature required when delivering and UK mainland delivery only: Beware! All parcels must be signed for on delivery. Our Carrier delivers between 8a.m. & 6.pm. weekdays (no weekend deliveries). Unfortunately, if there is nobody in to sign for and accept the delivery our Carrier will not leave the parcel. If for any reason a re-delivery is attempted our Carrier will charge an additional delivery charge, which we will have to pass on to you by deducting this amount from your debit/credit card. Please specify when placing your order in the delivery details section, if your parcel can be left in a safe place (at your risk) or if you prefer a particular day for delivery - not weekends. PLEASE NOTE THAT WE DELIVER TO UK MAINLAND ONLY AND SOUTH OF GLASGOW AND EDINBURGH. PLEASE PHONE US FOR DELIVERY COST IF YOU ARE OUTSIDE THIS AREA. Credit Card payments: As from the 13th January 2018, following a change in the law being forced upon us in respect of all payments by credit card, we hereby give notice that, with immediate effect, we can no longer accept any payments by way of credit card in the settlement of outstanding accounts. We will continue to accept payment of outstanding accounts by debit card and by Bacs transfer. We will only continue to accept cheques up to 30th June 2018 after which the only methods we will accept will be by bacs (direct) transfer into our bank account or by Debit Card. Please Note : The minimum online order for Barier H is 2 x 5L containers. If you require less than this please telephone our sales team. Online sales are available to UK mainland residents only. *Postage and packing is charged at �7.62 (ex vat) to customers living within the UK mainland south of Edinburgh and Glasgow, and �35 (ex vat) for those living in the Outer Isles and North of Edinburgh and Glasgow. For more information phone our helpful sales team on 01953 456363 between 8.30am & 4.30pm Monday to Friday.